With four Grammy nominations, a Golden Globe for “Entertainer of the Year” (1988), 63 gold and 24 platinum records, and a star on the Hollywood Walk of Fame, Engelbert Humperdinck has been a legend in the international music industry for the last forty plus years. He knows how to pick songs with eternal themes of love and longing, and lovers always want to hear them sung. 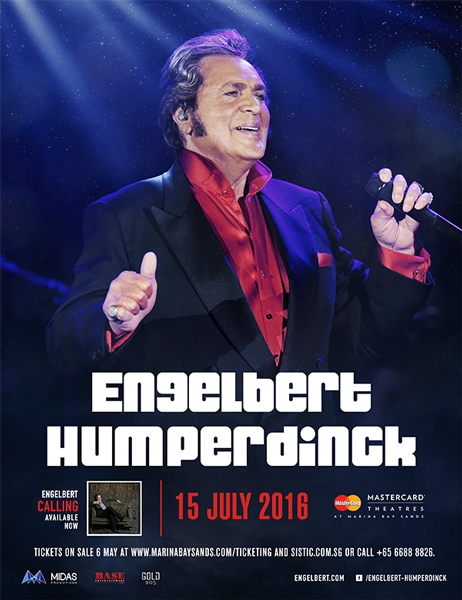 His latest album “Engelbert Calling” will be released in September 2014 and will feature duets with a who’s who of the music world, including Elton John, Willie Nelson, Smokey Robinson, Shelby Lynne, Charles Aznavour, Neil Sedaka, Dionne Warwick, Kenny Rogers, Lulu, Beverly Knight, and Gene Simmons.